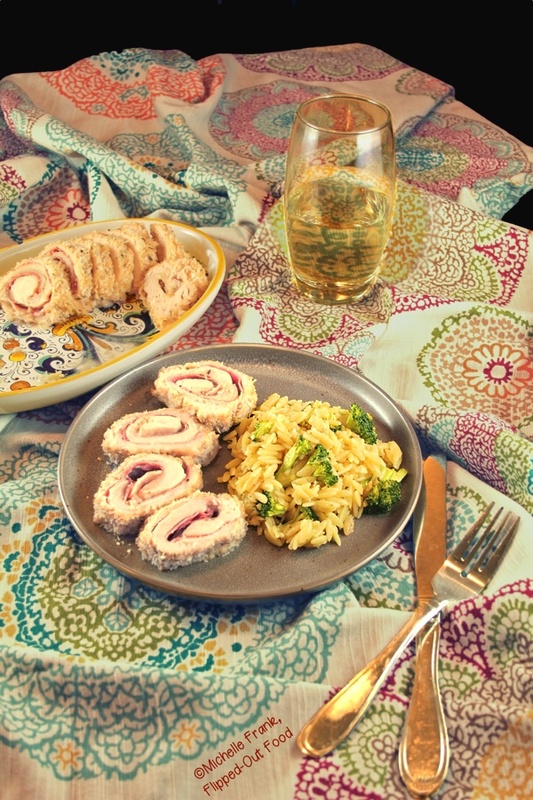 Work-ahead Chicken Rollatini is a perfect romantic meal for two. This is sure to be a date night or Valentine’s Day dinner favorite. Valentine’s Day falls on THURSDAY this year. Wah-wah. Making a romantic dinner for two is already hard enough without the added complication of having to do it on a weeknight, am I right?! Thank goodness for entrées like work-ahead chicken rollatini, which can be made almost entirely in advance. It couldn’t be easier! The night before our special meal, I take boneless, skinless chicken breasts and cut them in half lengthwise. Why do I do this? 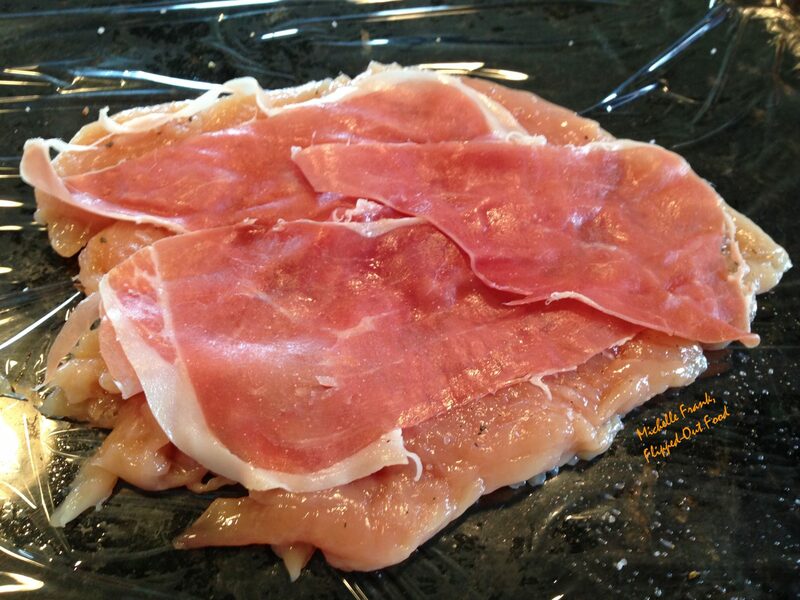 Most saltimbocca or rollatini recipes direct you to cut the chicken breasts in half crosswise and then pound flat. But in my opinion, my way is easier to work with: when you roll starting with the small end, the assembled rolls stay together better. You also end up with rolls that are almost exactly the same (see below), which simplifies the cooking time tremendously. Place each breast half between 2 sheets of plastic wrap and carefully pound the meat until it’s uniformly ~1/4″ thick. Note that the small end of the chicken breast requires much less pounding. Then, season the meat, lay on the prosciutto and provolone, and roll it up. To roll, start with the small end—wrap it tightly in plastic, and keep it in the refrigerator. This actually helps the rollatini keep its form during the cooking process: I didn’t even use toothpicks to hold it together, though you certainly can if you’re worried that the rollatini will come undone. Then, when you’re ready to start preparing dinner, pull the rollatini out of the fridge, remove the plastic, and get to work on the crust. This is a simple matter of dredging the chicken rollatini in seasoned flour, dipping in egg wash, and then carefully rolling the rollatini in the breadcrumb mixture. Let the rollatini sit at room temperature for about half an hour while the oven heats to 400°. Lightly coat a baking rack with cooking spray, set it into a foil-lined baking sheet, and set the chicken rollatini onto the rack. Bake for 30 minutes (or until a thermometer inserted into the thickest part of the rollatini reads 165°). Sometimes some cheese will ooze out of the ends of the chicken rollatini, but that’s okay. You can always scoop it up and dab it onto the plate! The hardest part is letting these golden-brown beauties rest for 10 minutes before slicing into them. 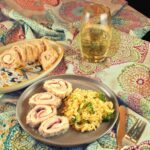 I love provolone in this chicken rollatini because it gives a sharp, ooey-gooey meltiness that perfectly complements the salty, savory prosciutto. Gruyere would also be fantastic. The breadcrumb coating is delicious in its own right, with a generous amount of grated Pecorino Romano, salt, pepper, and Herbs de Provence. A mixed-green or arugula salad with vinaigrette dressing would be a wonderful accompaniment to the chicken rollatini. My Arugula Shaved Fennel Salad or Asparagus Orzotto would also be a nice complement to the chicken. Since each serving is half of a chicken breast—AND because you bake the work-ahead chicken rollatini on a rack so that they’re not sitting in fat—this dish is also fairly light. You’d never know it from the taste! Don’t let the simplicity of this dish fool you: it’s every bit a romantic dinner—or any special-occasion meal. 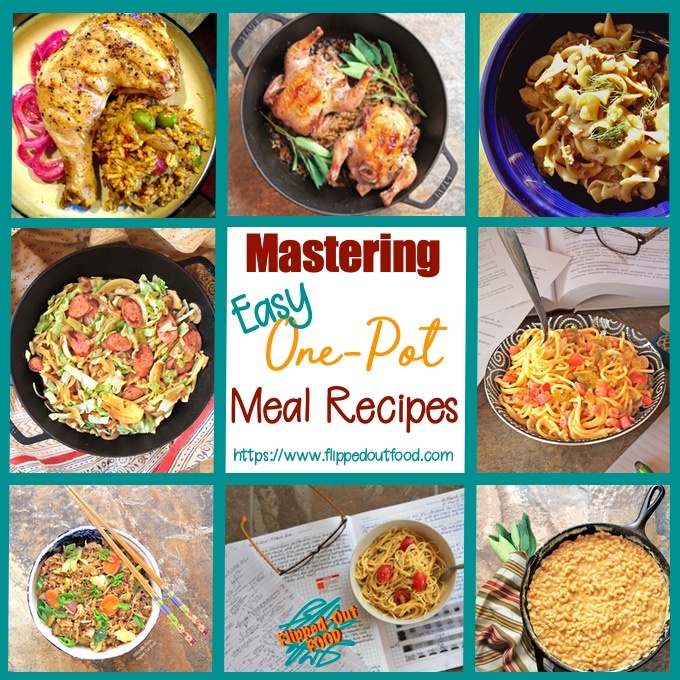 #CookBlogShare, a great food blogger recipe-share hosted this week at Everyday Healthy Recipes. Work-Ahead Chicken Rollatini is a perfect, romantic meal for two. Crunchy on the outside, with delicious, ooey-gooey meltiness inside. 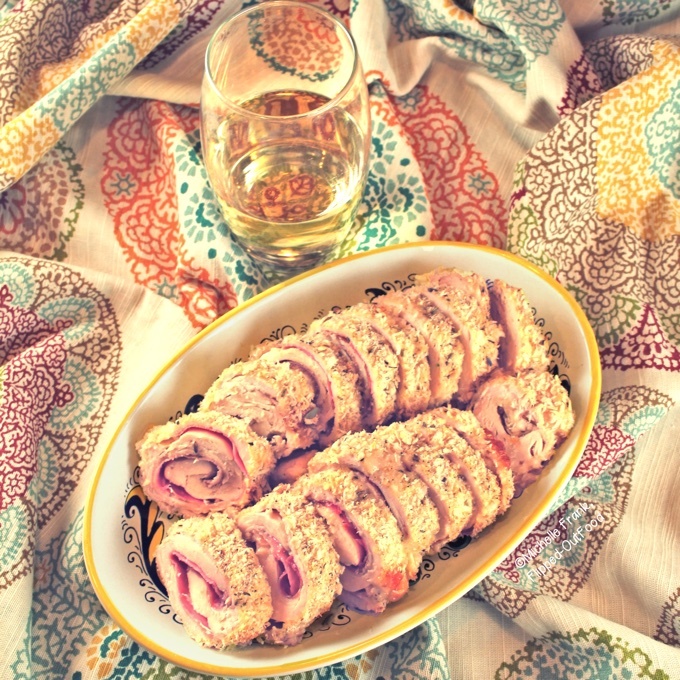 The chicken rollatini can be assembled the night before and kept in the refrigerator. 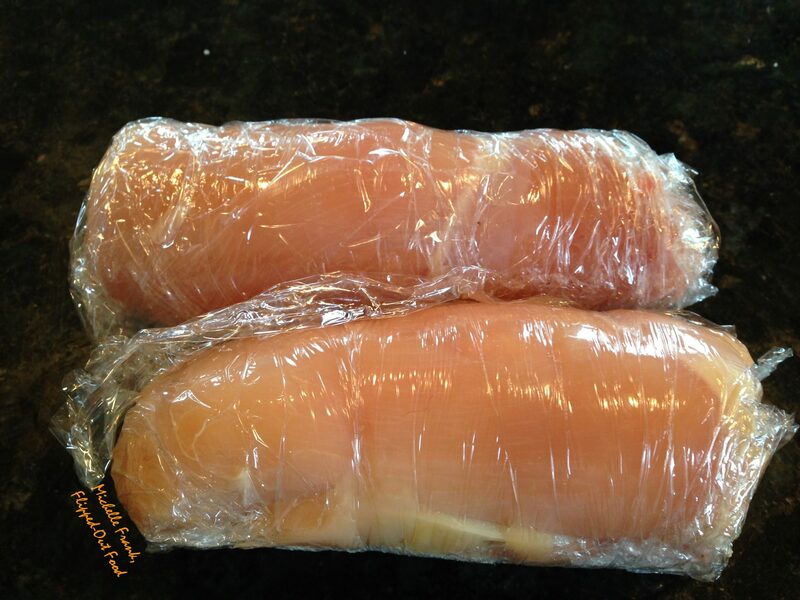 Lay each chicken breast half between two sheets of plastic wrap. Using a meat hammer, pound each half until it is uniformly ~1/4" thick, being careful to avoid making holes. Evenly season the top side of each breast half with a small pinch of salt and several grinds of black pepper. Lay 2 prosciutto slices and 1 slice of provolone cheese on each chicken breast half. Beginning with the small end, tightly roll up chicken breast half around the prosciutto and provolone (if the meat and cheese begin to squeeze out the other end, fold it back inward toward the center of the roll). Tightly wrap each breast half in the bottom piece of plastic wrap. Store in the refrigerator up to one day. Remove the breast halves from the plastic wrap: if the rolls do not hold their form, secure the loose ends of each half with a couple of toothpicks (avoid colored toothpicks: the dye will come off during baking!). Set up an assembly line to prepare the coating for the chicken rollatini: mix 1/2 tsp. of salt and 1/8 tsp. of freshly ground black pepper with the flour in a shallow dish or pie tin. Beat the egg and mix with the milk. Pour into a shallow dish and set next to the dish with the flour. In a third shallow dish, mix the panko breadcrumbs, Romano cheese, Herbs de Provence, and several grinds of black pepper; set next to the egg mixture. Coat each chicken breast half with the flour mixture, shaking to remove excess. Dip each rollatini into the egg mixture, coating evenly, and allowing the excess to drip off. Gently roll each rollatini in the breadcrumb mixture and set aside. Heat your oven to 400 degrees. Meanwhile, lay a sheet of aluminum foil in the bottom of a baking sheet and set a baking rack inside. Spray the baking rack lightly with cooking spray; set the rollatini on the rack, seam side down. Bake the rollatini for 30 minutes, or until an instant-read thermometer inserted into the thickest part of the rollatini reads 165 degrees F.
Remove the chicken rollatini to a cutting board and allow to rest for at least 10 minutes. Slice the rollatini crosswise into pinwheels and serve. Enjoy! This is SO good. It’s decadent without being super unhealthy and it makes a super special holiday meal (Easter in this case). Huge hit with the family. Thank you!!! Fantastic! It always makes my day to hear that a meal turned out well—especially for a special occasion like Easter! These look so delicious! Love the flavours and that it looks a bit special. What a lovely meal! Thanks, Monika! I agree: chicken breasts can get so boring on their own. It’s very easy to jazz them up and turn them into a special meal! I love a meal that can be prepped in advance. I’m cooking for my family of 4 this V-Day, they would all love this! Make-ahead dinner definitely make a weeknight celebration easier! This sounds fantastic! My husband would love it! Also like your tip about cutting the chicken breasts lengthwise-makes so much more sense! Genius!!! Thank you, Lisa!! You’re so kind! The flavors in this sound amazing! …especially that Prosciutto…yum!!! Yum, I love stuffed chicken breast and this sounds fantastic!